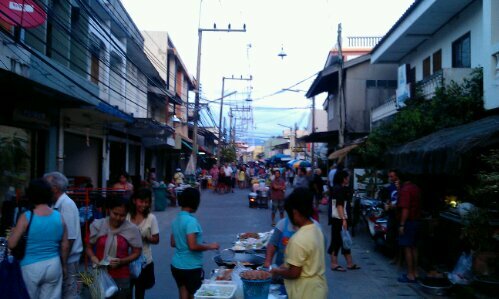 After a lazy day on the beach and a nice nap we resumed all our energy and walked down to Koh Phangan’s main town Thong Sala to see the “Saturday Walking Street”, a street turned into a pedestrian zone with lots of street vendors and food carts. First of all I got myself a new bikini for the tremendously high amount of 320 Baht (8€) as I had ruined my white one some days ago in Koh Tao. I had put it, wet as it was, on the bed post of our iron bed, staining it with lots of rusty spots and as it was slowly falling apart anyway I decided it was time for a new one. So I got a Thai tourist standard: a bandeau bikini in bright white, green and purple stripes. 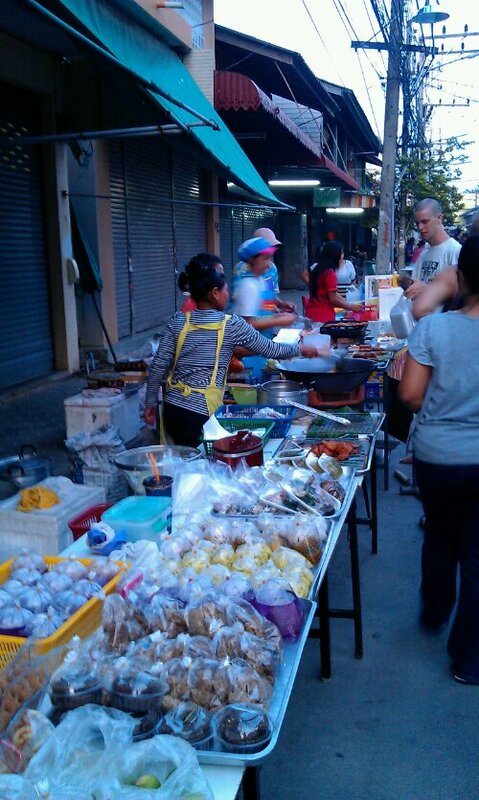 Then we started our street food experience. First we had nicely barbequed chicken with satee sauce (delicious!). Now, being braver we tried some deep fried little omlet like things (turmed out to be quite spicy), then some grilled rice on a stick which we thought would have some kind of filling (which it didn’t, so quite boring). And the we had steamed corn and something that looked like meatballs on a stick but was some kind of spicy fish cake. To finish our gourmet run off we had some more chicken satee and some spring rolls. There was of course more food that we didn’t dare to try. Seafood salad didn’t seam the wisest idea in this weather and all kind of prepacked dinner in little plastic bags seemed more proper for Thais than for us. Funny was also to see a globalisation process: even though many vendors didn’t even speak a bit of English and cooked their thing in a probably quite traditional way, they also entertained their kids that were sitting nearby by letting them play with their smart phones. Now I hope this article will get uploaded properly as I had already finished it when half of it just vanished in the last attempt to upload it. Then we’ll have our goodnight beer in the resort next door and go to bed again (sleeping seems to be our favourite hobby here). 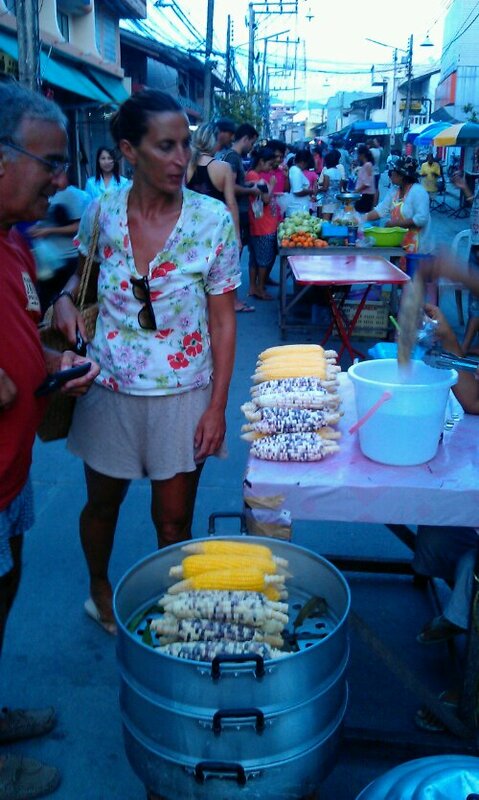 This entry was posted in Thailand and tagged Food, Koh Phangan by kathatravelling. Bookmark the permalink.